Sessions are conducted in a relaxing atmosphere. This process does not involve any physical touching or manipulation. Session does not have a defined procedure; it is directed trough heart intelligence. The healing frequencies that are initiated during the healing session continue to work with you long after the session is completed, for however long they are required. It is recommended to have three healing sessions, not more than a week apart. Usually, after the third session it is obvious if there are significant changes, and usually three sessions are enough. There is no need to have regular sessions for this particular problem a client complained about. 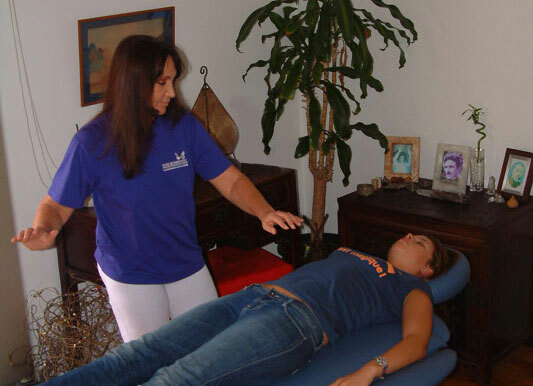 Tesla Healing Metamorphosis can be performed on distance, without physical presence of the client. For this process it is irrelevant if the client is present in the room, or on the other side of the world. Practitioners create communication with their clients on the level of the conscious, subconscious and integrative mind. During this communication, they write down everything that comes through, exactly as it comes through, and send it to the client. In Tesla Light Body Metamorphosis the procedure is very precise. It is important that the process is led as it is defined, according to the energy flow (axiatonal lines) and the vortex centres of energy (chakras) of the human body. The practitioner works around without physically touching the body. Using Tesla Metamorphosis frequencies, he draws very precise lines and points on the body with the beam of energy and light coming from the palm chakra. This process is done once in a lifetime and it works with you for the rest of your life, re-establishing the healthy relationship with the Self and the Divine. It is done in two sessions in two consecutive days (or not more than 48 hours apart). Between the session one and two it would be good to avoid any stressful situations, as you might be more emotionally vulnerable, and thinks might seem to you more important then they really are. It is recommended, but not compulsory, to have one, two or three Tesla Healing Metamorphosis sessions before Tesla Light Body Metamorphosis, as the healing sessions bring the body into balance, and that helps the process to go more smoothly. For those who wish to attend Tesla Metamorphosis III seminar, it is compulsory to have this process completed before the beginning of the seminar. * Wear comfortable clothes. You will be resting face-up on a padded table with your shoes off during the session. For Tesla Light Body Metamorphosis sessions please chose garments that will allow practitioner to see all parts of your body. * Avoid perfume and use of scented cosmetics before your session, as it might prevent you from having a complete experience in the session. All jewellery is fine, as long as it is comfortable. Tesla frequencies of energy cannot be distorted or stopped by metal, leather or even rubber. Tesla Healing Metamorphosis lasts 30 minutes, and Tesla Light Body Metamorphosis 30 to 45 minutes. It is not possible to predict the time for Tesla Soul Communication. During the session you will be asked to lie down and relax with your eyes closed. It is best to be in a state of openness and to allow whatever is supposed to come about. It is not recommended that you meditate, pray or attach to any specific outcome. Be receptive to the experience, knowing that you are participating in a positive process brought to you from God/Love/Universe, and intended to give you exactly what you need at this time. Each individual has unique experiences; some report sensing scents, flavours, hearing sounds, feeling vibration, changes in temperature, seeing colours, some see different people, landscapes different from planet Earth, angels; while some are just very relaxed. All experiences are pleasant. Experience on the table are not related with the result of healing; it does not mean that the person who had more sensations during the session is more likely to receive the healing, or opposite way around. Anya has a limited time for sessions. Check Seminars Schedule to see when she might be in your area before booking session with Anya. We will respond soon. Anya does not do distant healing sessions. Find a practitioner in your area.